SUPPORT Pastor Brad & The PB Rocks Ministry! When you shop Amazon--Click this banner to go there! Thanks! I’m In You is an 80s Christian metal theology lesson about the reality that when we receive Jesus as Savior and Lord—we are baptized by The Holy Spirit into Christ and simultaneously the Spirit of Christ takes up residence within us. So, literally, we are IN Christ and Christ is IN us! If you enjoy hard rock riffs, heavy metal guitar leads and thunderous bass and drums blended with Christian lyrics/vocals belted from the heart—you will totally dig this 80s Christian Metal Anthem, I'm In You! Here's track 8 from CRUSH, "Rip Tide" Enjoy this 80s style Christian metal anthem about the battle all Christians fight against the forces in this world that try to PULL US DOWN. The Good News is--the One who is IN us is GREATER than the one in this world (1 Jn. 4:4)! “Riptide returns things to a straight on metal direction. Starting to a short drum solo, the song plows ahead as driving guitars dominate the backend with bass taking over for verses to feature spoken word delivery: “Mighty fortress of refuge, Jesus my King it’s to You that I run. Because I know on the cross when You said it is finished You meant it was done”. As impetus returns, rhythm guitars recoil to buttress the heavy hitting chorus: “But Your love is lifting me, uplifting me higher. Risen up!” Powerful but catchy, “Riptide” is by far the albums strongest cut- there is a reason I woke with its melody stuck in my head!" CLICK THE IMAGE TO LISTEN! 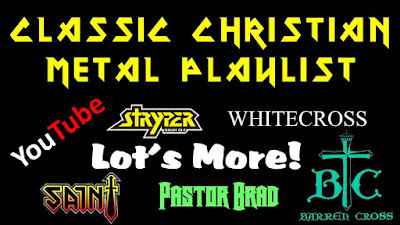 Stryper, Whitecross, Barren Cross, SAINT, Pastor Brad, Bloodgood, Altar Boys, Chrystavox... nuf said! Enjoy this collecetion of CLASSIC 80s Style Christian Hard Rock/Metal Songs! I've always struggled whenever I hear people used the phrase, "my Jesus," as in "Well, my Jesus would never..." or "My Jesus understands... " etc. in a way that forms Jesus in the image of that person and makes Him subservient to their world-view--instead of the other way around. So, this song is sort of a rant against this phrase, and a call to surrender to Jesus as Lord and King. Enjoy! My Jesus is an 80s Christian metal soap-box-rant/praise-worship song. I’ve always struggled when I hear people use the phrase “my god” or “my Jesus” in ways that try to conform God into people’s personal world views, i.e. make god in their image instead of recognizing God as the Sovereign and Holy God of Scripture that He has revealed Himself to be. If you enjoy hard rock riffs, heavy metal guitar leads and thunderous bass and drums blended with Christian lyrics/vocals belted from the heart—you will totally dig this 80s Christian Metal Anthem, My Jesus!